Journey of life...! : What the dog saw? 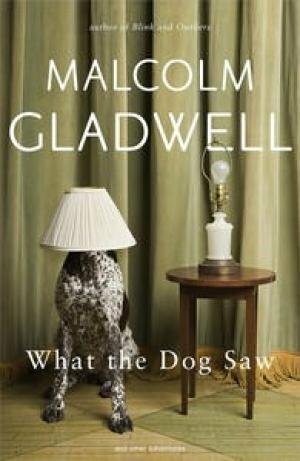 Well, to begin with I would like to say, Malcolm Gladwell did create an impact on me through his yet another thoughtful and mind boggling book – What the dog saw? And now I know the story behind the tomato ketchup and the complete story behind Enron scandal to the least among them. I used to wonder how on earth some processes are evolved or rather, which was the first move or who were the pioneers of them? After reading this book, I am convinced atleast on some of the stories and the commitments behind any successful product or a process or a person. The topics range from ketchups to plagiarism to failure. Starting from the inventors of the automatic vegetable choppers, Nassim Taleb’s investment strategies, hair dyes, Enron and many more stories have been discussed in the book. Basically this book is a collection of Gladwell’s favorite articles from the New Yorker since he joined as a staff writer. Each story is 15-25 pages long, and is self-contained and can be read in any order. Every topic he writes about, the depth he gets into is just impressive. Atleast I have wanted to read more of him. He brings out some of the fascinating perspectives of every story that we even would not think of it otherwise. These essays cover various subjects which may be appealing to the variety of the readers and their interests. The book is divided into three parts. First part is about the ‘Obsessives, Pioneers and other varieties of Minor Genius’. There are about six stories in this part. First is the story on the conquest of the American Kitchen through the pitchman strategies. Next the story behind ketchup and curiosity of answering the question – why has ketchup stayed the same? Third story is on ‘How Nassim Taleb turned the inevitability of disaster into an investment strategy.’ Although I have started reading his bestselling book ‘fooled by randomness’, this story gave me a good impression about Nassim and his talents. In the next story, There is the woman who came up with the slogan “Does she or doesn’t she?” and made hair coloring respectable to millions of American women. Fifth story is on the inventor of the Pill, a devout Roman Catholic who believed he had found a natural means of regulating ovulation that his Church would welcome eventually leading it to a major error. The last story is the title of the book itself – What the dog saw? - Terrific account on Cesar Millan, the American ‘Dog whisperer’ and the movements of mastery. Second part of the book talks about eight stores and what he calls the ‘Theories, Predictions and Diagnoses’. These are the hazards of statistical prediction, especially when it comes to spectacular failures like Enron, 9/11, the fatal flight of John F. Kennedy Jr., the explosion of the space shuttle Challenger. Some of my favorite stories are from this part. This includes the complete story behind the Enron’s open secrets. Had I not read this, I would have missed a lot of details on the intelligence and the dangers of too much information. Now I know what and how exactly it happened with detailed analysis. There is a story on Million-Dollar Murray, about the problems of homelessness and the ways of solving problems of the same. This part also has a brilliant story on plagiarism that describes a specific incident on what happens when something is borrowed and discuses on charging of plagiarism ruing one’s life. I also enjoyed reading story of ‘the art of failure’ that explains why some people choke and others panic. And what exactly happens when someone does panic or chokes. It is a fascinating examination of how experience plays a part in how you'll fail when you do fail. This was a real good read. The last part of the book is about ‘Personality, Character and Intelligence’. These are about indication, about individuals rather than events. Why, he asks, is it so hard to predict the performance of artists, teachers, quarterbacks, executives, serial killers and breeds of dogs? This part also contains eight stories and some of the Gladwell’s best writings to me. He has written about Late Bloomers, people who are most likely to succeed, some of the dangerous minds, the talent myth (about overrating of the smart people), and some trouble makers. Although I was feeling bored while reading the first part because of its length and depth, the stories in the second and third parts were delightful to read. Not every essay will be of equal interest to all, but there is variety enough for all to enjoy. Some of the topics may sound uninteresting, but ignoring them will mean missing some real good ones. Every essay I read, made me say “Oh, that’s interesting” atleast once. He is such a good writer. The depth he goes in to every story and the patterns he comes up with and the arguments he raises are very clear, crisp and provocative. I have read all the four books by him. Every time I read his book, I learn a new way of looking at things, a new way of understanding problems and solving them. Also a new way of how not to fail? Thank you for a very helpful review. As you say, the book is a collection of previously published stories. All the same it is good to have them in one convenient package. It is generally accepted now that vast information does not lead to either knowledge or understanding. I have held the view virtually all my adult life that excess information can actually hinder acquiring knowledge and eventual understanding. The constant flow of information literally takes away time for reflection. Internet hype has not advanced understanding one iota. All of us have an unwarranted amount of data on the Gulf Oil Spill Disaster but no one has figured out a way to mitigate it and avoid it in the future. Gladwell has a way of narrating that is wonderful. Your review is very helpful. Indeed a nice book... I just finished reading it. @booklover: thanks for dropping by and as usual nice comments! @Manjula: Good to know that you read this book. Just curious to know -Which is the story you liked and why? @booklover: Were you able to attend the book club meeting on 24th 25th? how was it?